Sweet mustardy sticky skillet cauliflower florets, on a bed of crispy romaine, with the zing of red onion, pops of cherry tomatoes, and creamy avocado. Add the cauliflower to a large bowl, and pour over half of the dressing (saving the remaining half of the dressing for later). Toss to coat all of the cauliflower. Heat a large pan or skillet over medium-high heat, and add the cauliflower. Sauté turning the cauliflower every few minutes until the cauliflower is browned and tender all the way through, about 10 minutes. 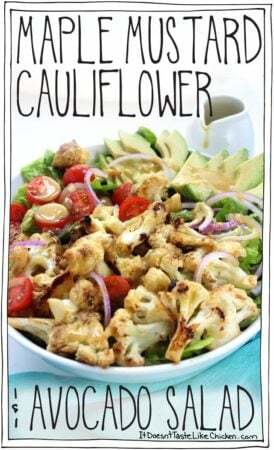 Prepare the salad by dividing the romaine amoung two large salad bowls and topping them with the tomatoes, avocado slices, red onion, and the cooked cauliflower. Drizzle the remaining dressing over the salad to taste.